William Henry Bartlett visited North America in 1839/1842. He drew many views of United States Cities and scenery, which were then engraved on Steel Plates. The results were a unique record of the times and appeared in the Book - American Scenery - Published in London in 1840. The two-volume book contained a map, two title frontis pages and 118 views. 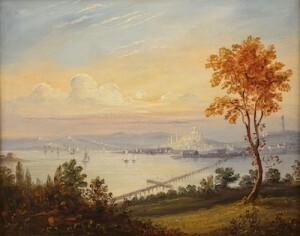 Boston and Bunker Hill (From the East) is one of the plates engraved by Charles Chousen (1819-1889), this painting being of similar composition.